She had been kicked out of her real senior apartment for sending billowing smoke from the microwave into the hallway, which set off the smoke alarm causing all the elderly to evacuate the six-story building into a winter night. She told the firemen she knew nothing about any smoke coming from her room. Looking back at photos, I see her decline was frighteningly rapid. She went from wandering the nursing home with an ankle monitor to being unable to walk to being unable to complete even half a sentence. Then she needed help eating. She became a tiny, sleepy shadow of her normally feisty, busy-body self, and the despair I felt seeing her like that was soul-crushing. I was left feeling grateful for the smallest of things. That she usually remembered who I was had become a very big thing. but their season was over. It was during my mom’s last year or so that I began writing poetry, documenting my experiences at the nursing home while hoping to prevent myself from getting Alzheimer’s by keeping my mind sharp. Poems That Come to Mind appeared on Amazon.com a few days before my mother felt ill and never recovered. The book is a tribute to her and our new friends at the nursing home with dementia. 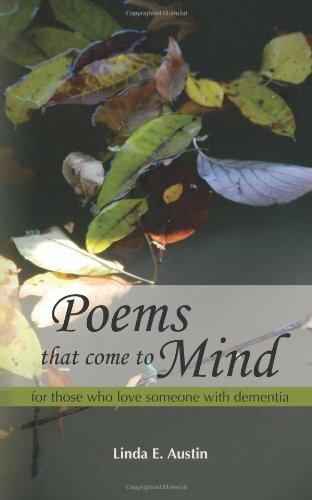 The bittersweet poems give dignity to those lost in dementia and are reminders that despite the tragedy of Alzheimer’s there is still beauty in their lives. Small moments, in fact, can carry an exquisite sweetness when those simple pleasures are all that is left. Accepting the situation was key to being able to see and appreciate these sweet moments with my mother. The visits where I could relax and slow down time with her let me notice and appreciate the littlest things, like feeling the quiet peace of just holding hands, listening to a dove coo on a warm afternoon, or singing an old lullaby together. Being with the other residents let me have special moments with them, too, looking at magazine photos, taking turns sniffing a flower, or simply sharing a smile hello. Many times someone would momentarily break free of the dementia clouds and come out with a funny or feisty remark that would set us all to laughing. You never know what they might say! Even if your dear one sleeps most of the time or doesn’t know who you are, he or she can feel your touch and hear your voice and can feel comforted by your presence. Talk to her, sing to him, kiss her and tell her you love her. She is there, he is there. Watch for the little precious moments and carry them in your heart. Author: Linda Austin enjoys poetry and encourages life writing through her blog at http://moonbridgebooks.com. Her books include her Japanese mother’s WWII memoir, Cherry Blossoms in Twilight, and Poems That Come to Mind: for those who love someone with dementia. Linda lost her mother to Alzheimer’s in November 2012. During and later journaling and writing my memories, I referred to these moments as “grief-relief” moments. It’s important to find those “sweet moments” or moments of grief relief to help us deal with the reality of losing our loved one to Alzheimer’s Disease. Thanks for sharing.